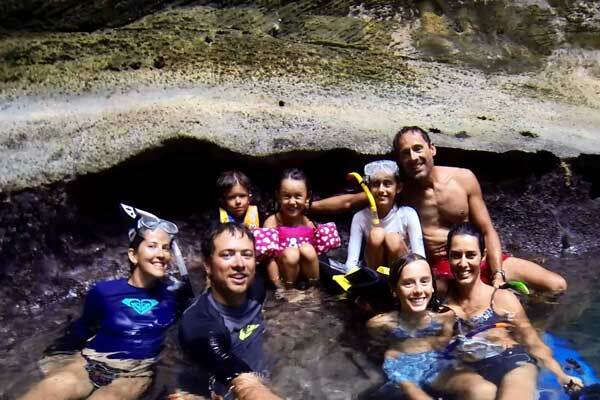 The whole crew on our visit to Thunderball Grotto. On our second day in Black Point, Carter had decided that he was bored with Mom and Dad for company and it was time to find himself some new friends. 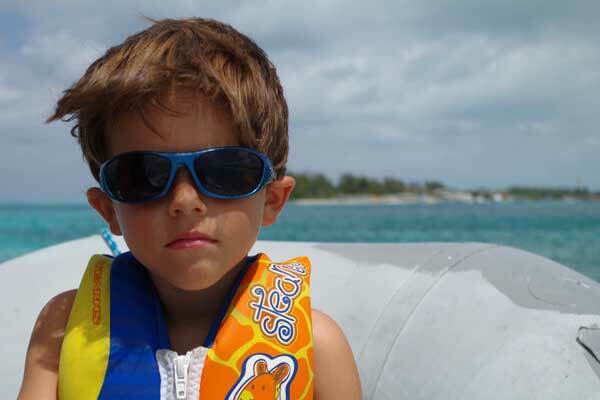 Up to that point in the trip we had seen precious little of other families on cruising boats and even Dan and I were ready for some interaction. Carter attempted to make a VHF call by saying, “Calling all vessels, are there any kid boats in Black Point?” to no avail. Then, as we were coming back from a water run some motion caught my attention out of the corner of my eye. Little people! We saw a few kids jumping off of their boat and swimming not too far from us. Our crews plus that of another boat family on Del Max. Carter and I unceremoniously ditched Dan and the water jugs to go check out the action. Sure enough when we pulled up to their boat, Zazen, we found three girls with their parents enjoying the warm water. And thus began our first foray into buddy boating, as we made arrangements to meet at the beach. We made our way back north with them, seeing sights for a second time in a new light with another family to share them with. On one long hike, we never quite made it to the destination we had intended, but Carter and Paloma managed to have a great time anyway jumping in puddles, picking fruits from bushes, and having the enlightened conversation of four-year-olds. When I asked Carter afterward what he thought about the hike he replied, “Mom, it was very hot and very amazing.” Well put. While we only spent a week together on the water, it felt like we had known them for years by the time we had to say good-bye. This was the end of their trip and only the beginning of ours so we unfortunately had to part sooner then we (or the kids) would have liked. Such are the friendships made while traveling. We look forward to meeting more cruisers and hope to see the crew of Zazen again in the future. Another lesson to add to our last list: water and electronics don’t mix! Due to a combination of my phone getting a salt bath and us being out of Wi-Fi and cell phone range for a few days, we’ve learned what incognito really means. 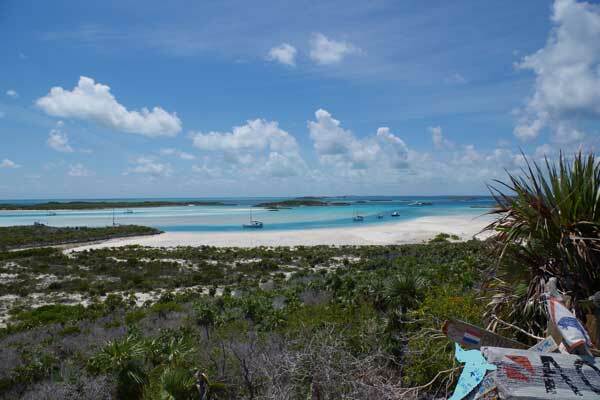 Luckily, we’ve had plenty to occupy our time and attention with the last two weeks in the Exuma Island chain. This iguana was standing sentry for the rest. He called out all of his bodies once we got to the beach. 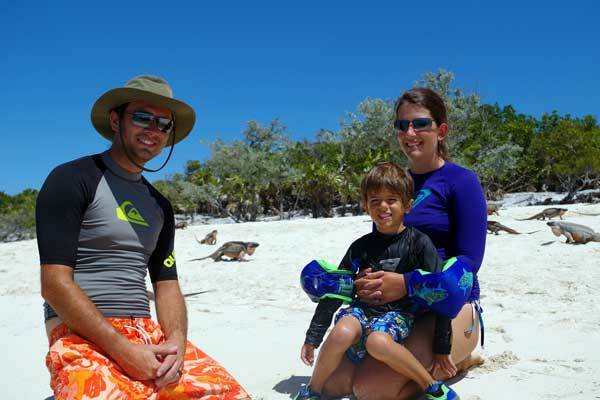 We spent our first two nights in Allen’s and Highbourne Cays where we got to spend some time with the famous iguanas. As we pulled into the anchorage, there was one iguana standing sentry in the middle of the beach but as soon as dinghies starting pulling up they starting appearing everywhere! 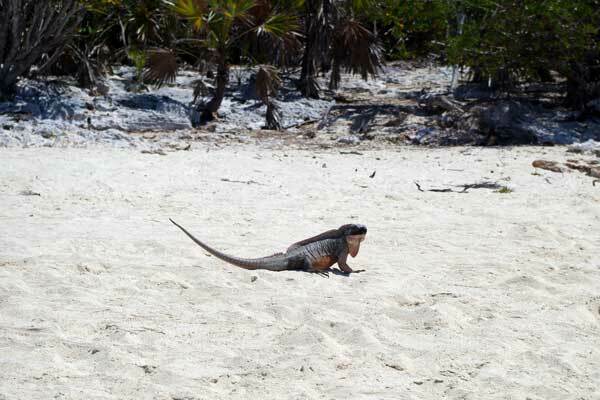 Nearly 100 iguanas swarmed onto the beach, waiting for the handouts they’ve obviously been conditioned to expect. We kept our distance, but the iguanas certainly were not shy at all! Even with having to pull the dinghy, the scenery made up for it and then some! The most beautiful beach of our trip so far. 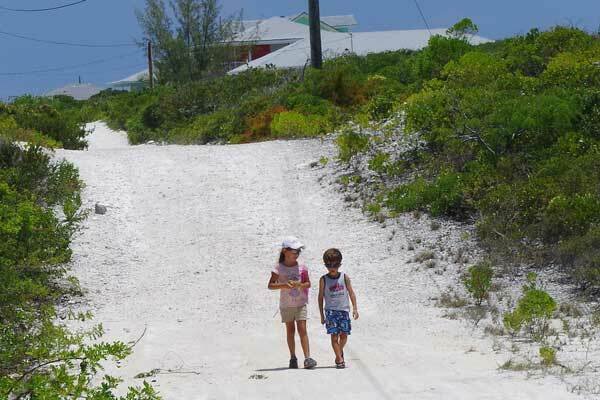 From Higbourne we journeyed into the Exuma Cays Land and Sea Park, with our first stop being Shroud Cay. Shroud Cay is essentially a ring of solid land surrounding a huge mangrove field with two creeks running through the middle. 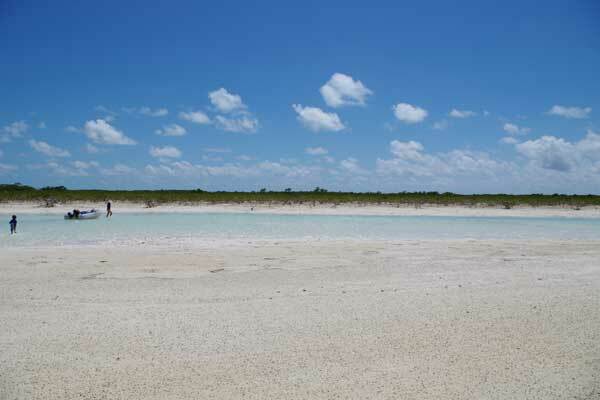 We decided to journey by dinghy on the northern creek to the Exuma Sound on the east side of the island. What we didn’t realize was we should’ve gone around high tide, so Dan and I got to play barge mules whenever the creek got too shallow to drive our dinghy. Never the less, it was one of the most beautiful hikes we’ve ever done and the beach at the end of the hike was by far the most beautiful we’ve seen so far in the Bahamas. Next, we moved on to Warderick Wells which is the home to the park office and another beautiful destination. 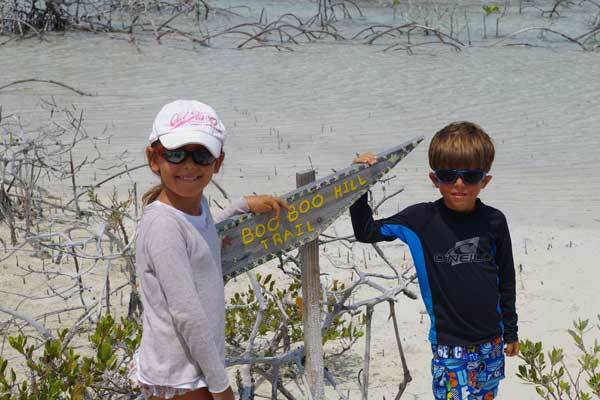 We hiked Boo Boo Hill, where the legend says the ghosts of a shipwreck still haunt. 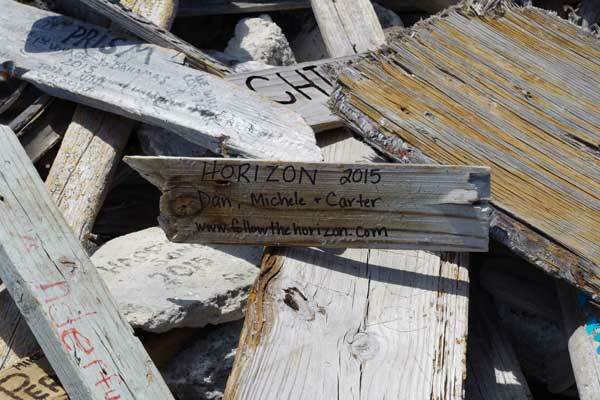 Boats leave a piece of driftwood with their name on the top of the hill and we left ours too. What we didn’t realize was how elaborate some of the decorations would be! The view from the top was spectacular but we were ready for a dip at the beach after a hot hike in the sun. You can see the whole crew swimming out for a taste. Carter was nervous about the pig biting his fingers! 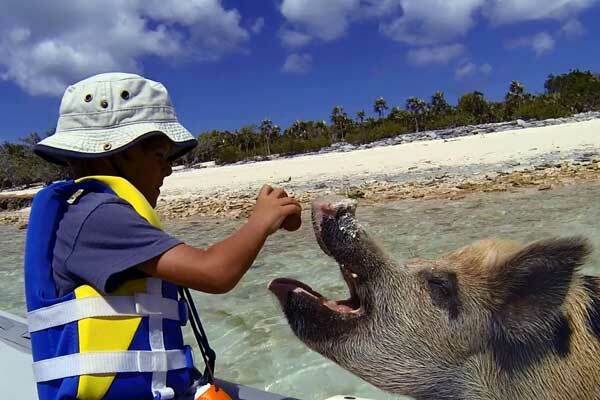 Finally we made it to the famous Staniel Cay, home of the swimming pigs and Thunderball Grotto. We visited the pigs on our first day, not knowing exactly what to expect. 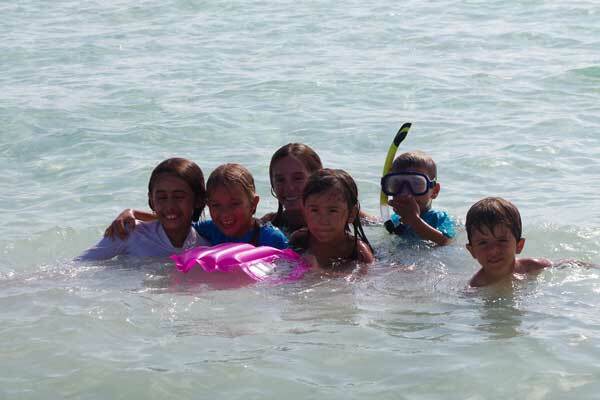 As we pulled up in the dinghy, they saw us coming and starting swimming out to us, especially once they figured out that we had brought them some raw potatoes. 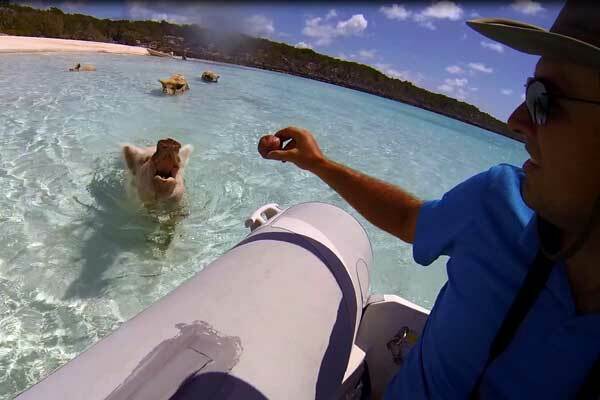 The biggest pigs were so excited they were pushing into the side of our dinghy with their mouths open like baby birds! We decided not to even get out since we didn’t want Carter to get accidentally knocked down or stepped on by the over-excited hogs. Thunderball Grotto was a magical place! Most of the entrances are underwater at high tide. Thus far in the trip, we hadn’t been able to convince Carter to try snorkeling with us. That all changed at Thunderball Grotto. 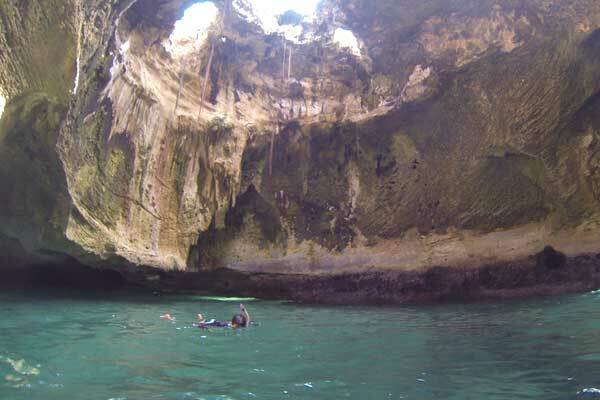 The grotto was made famous by the James Bond movie Thunderball and is truly just as beautiful as the movie made it seem. We made sure to go at low slack tide so that Carter would have plenty of clearance into the low cave entrances and so we wouldn’t have to fight the strong current that runs through. 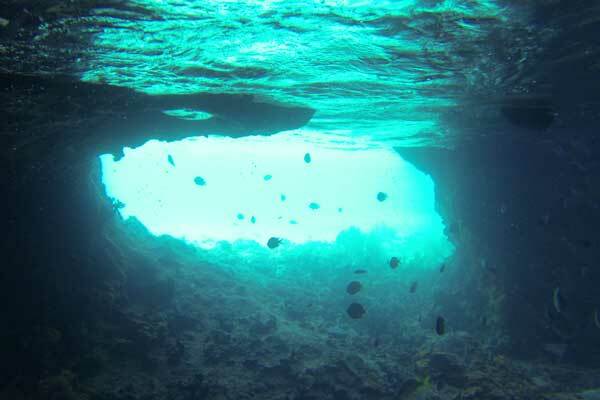 When you come into the cave, it is amazing to see the shafts of light shooting down into the amazingly clear water filled with fish and colorful coral and sponges. 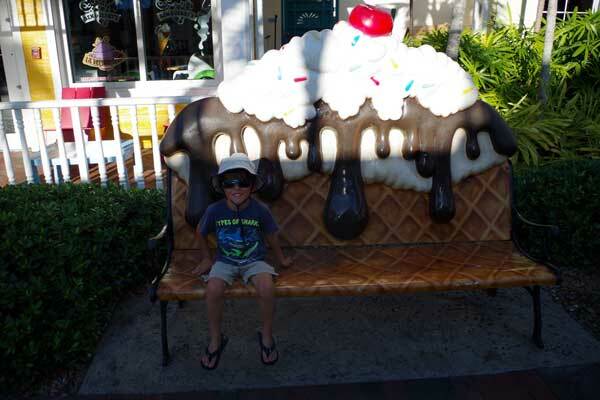 Carter loved it so much, he immediately started asking us when we would come back again. At the time, we didn’t think we would but he got his wish the next time we came back through. More pictures and buddy boating stories to come soon! Take seasickness medicine as soon as you feel sick (some even say beforehand if you are prone to bad bouts). Trying to tough it out only makes you miserable, it doesn’t go away without dry land under your feet. Weather forecasts aren’t always right. This might seem like an obvious one, but there’s something about paying money for forecasts that makes it seem like they should be more accurate and more frustrating when they aren’t. Paper charts are worth the cost but not only for a back-up to electronics. Our Explorer charts of the Bahamas have been invaluable in planning our routes, something that is significantly harder to do on a chart-plotter or other small screen. It is also nice to have two different sources of chart information. If your charts and instruments (including your eyes) disagree, trust your instruments and proceed with caution. Charts aren’t always accurate and if the visibility is bad, it’s always better to err on the conservative side to avoid problems. Once you get used to the sounds and reactions of your boat, be wary of believing your gauges if they are telling you something that doesn’t seem to jive with how your boat is acting. We lost significant time on our trip to Nassau because an electrical short was telling us that the engine was running hotter than it really was. If we would have tested the gauges sooner, we wouldn’t have lost those (very uncomfortable) hours. Calling a boat by name (thank you AIS!) usually produces a response from the captain. No name, forget about it. Moving around in an anchorage can produce dramatically different results in comfort levels. This is especially true if you can get tucked in slightly farther behind wave obstacles or get out of the typical line of traffic coming in. Fix the annoying noises your boat makes at anchor, it’s worth it! Rocking at night we can handle, creaking all night we can’t. Salt + inside of the boat = bad. Rinsing off with fresh water in the cockpit is worth the price of a gallon or two here and there. If glitter is the bane of the craft world, sand is the bane of the cruising world. Once it sticks, it is impossible to get rid of. What lessons did you have to learn the hard way? We spent some time walking around the Marina Village at Atlantis. If a week in Bimini was surprising in how different from the United States it was, a few days in Nassau was just the opposite. We chose to stay at the Nassau Harbor Club Marina which is located at the far eastern side of the harbor. Even though it was farther away from the typical tourist attractions, it did have one major advantage…the awesome grocery store and Starbucks right across the street! To be honest, it was a bit comical how excited we were over what seemed like lightning fast internet at Starbucks after months on dodgy marina wi-fi networks. We had heard from guidebooks and friends to make sure to stop in to Solomon’s Fresh Market for groceries and now we know why. It was exactly like a Fresh Market or Kroger at home, complete with a full assortment of organics and basically everything you would expect if you were shopping in the States, just at Bahamian prices. Some things were pretty similar in price (bread, fruits and vegetables, etc) while others were much more (like $10.99 for a pound of chicken breast!) We didn’t have too many things to stock up on other than some perishables, but we figured we’d replenish what we could before heading to the Exumas. Carter loved watching the animals in the huge aquarium. 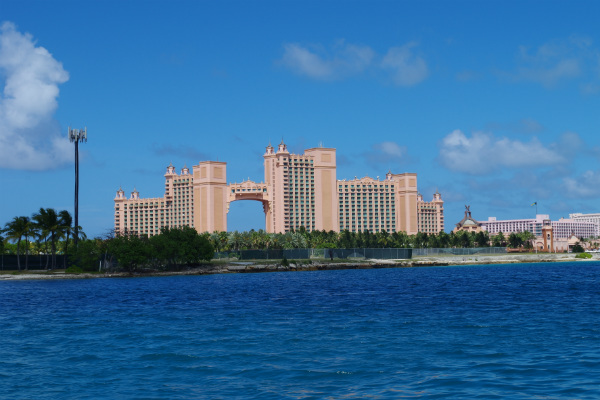 On Monday, we decided to hitch a taxi ride over to Paradise Island to visit the famous Atlantis Resort. Even though Dan and I had visited after my brother’s wedding (and our engagement) in 2007, the resort was significantly bigger and more opulent this time around. Beautiful fountains, tile mosaics, and Atlantis “artifacts” are everywhere in sight. 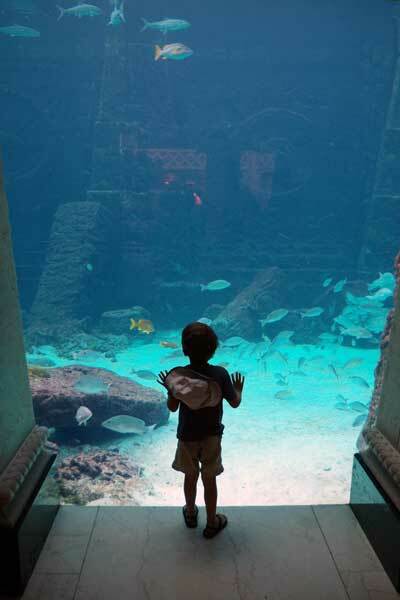 The aquarium is a wonder in itself and is free to visit. While we considered paying the extra cost to go to the water park, we decided that the $120/person price tag was just a little more than we were willing to pay. We did tour the marina though and let’s just say we saw a 58 ft Azimut that looked like a dinghy compared to the mega-yachts docked there! 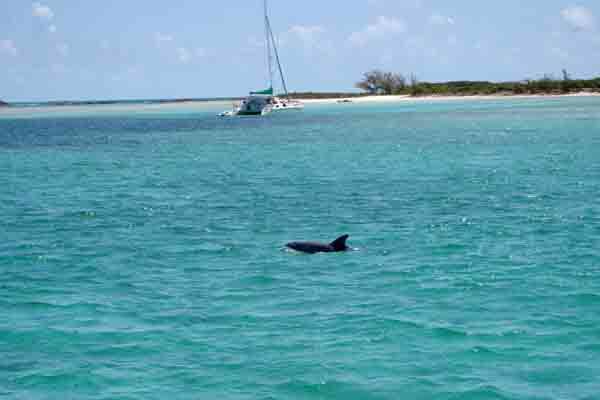 This dolphin greeted us just after we anchored at Rose Island. After stocking up and sight-seeing, we were ready to get out of marinas for a while and get to a nice anchorage. 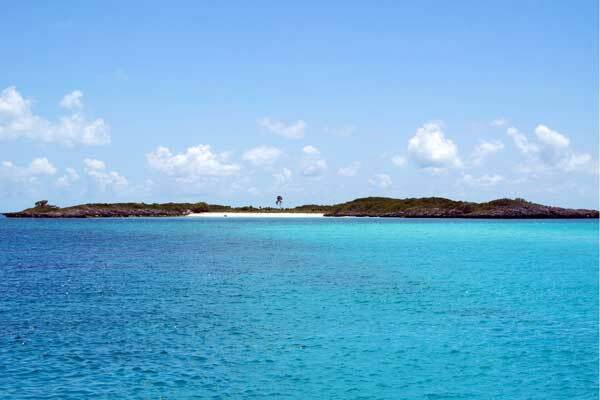 Our first inclination was to head straight for Allen’s Cay, but we tried a night at Rose Island just north-east of Nassau first due to a great recommendation from our friends Peter and Gale. We liked it so much, we ended up staying for two nights instead! (though we did tuck a little further in to the anchorage on the second night to reduce the swell.) We all enjoyed exploring the little rocky island on the south side of the anchorage, even the dogs. Visiting at both high and low tides gave us a great teaching opportunity for Carter to learn about tide pools and the myriad of animals that make their homes in shallow water. Our beautiful view of Nassau Harbor from Rose Island. We’re finally starting to get in to the swing of cruising and just in time too. 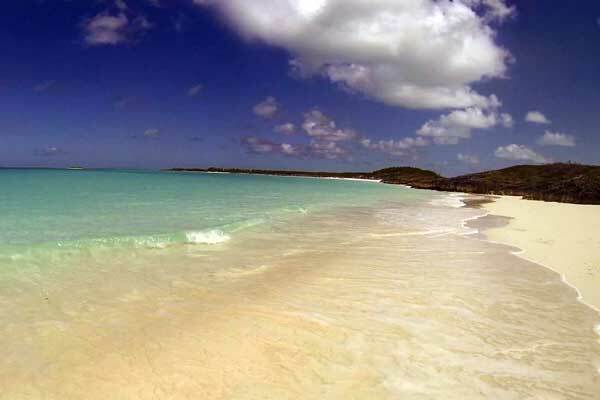 Next stop is the Exuma chain with the reputation of some of the best cruising grounds in the world. We can’t wait! A beautiful afternoon for a swim. Friday morning we were finally ready to get out of Bimini. 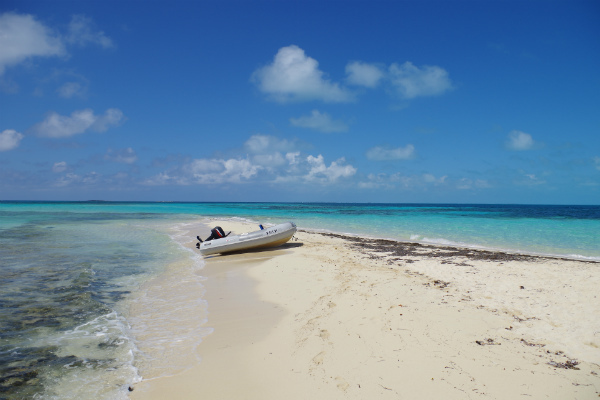 We took a short hop down to the anchorage at Cat Cay. It was still bouncy since the winds had been coming across the banks for a few days, but at least the wind and waves were coming from the same direction this time around. Once we were safely anchored, we decided to take our dinghy over to Honeymoon Harbor, about 2 miles from our anchorage. We had heard that it was a great place to stop and we are glad that we did! This one practically climbed my leg! 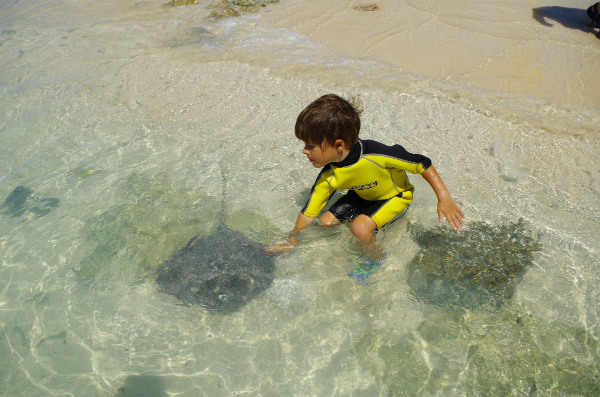 Carter loved being able to touch the stingrays as they swam by! We knew that Honeymoon Harbor was famous for having stingrays, but we made sure to hedge our explanation to Carter to manage his expectations in case they decided not to show up. Luckily, that was unnecessary because there were plenty for us to see! 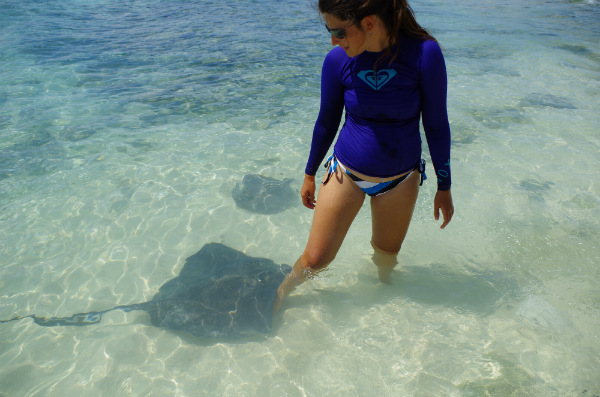 As soon as we waded into the water, the rays would immediately start coming towards us. They made many passes close enough to rub your hands along their backs and even a few times rubbed against our legs as they went by looking for food. We spent the whole afternoon playing on the beach and swimming with stingrays, exactly the kind of day we had dreamed of for years! Both Dan and I commented afterwards that it was actually somewhat unnerving to have the multiple stingrays gliding straight towards you in the water. Regardless of how cool it was, we were children of the 90’s and remember distinctly the unlikely death of Steve Irwin at the tail of a stingray. Our first fish was a black fin tuna! 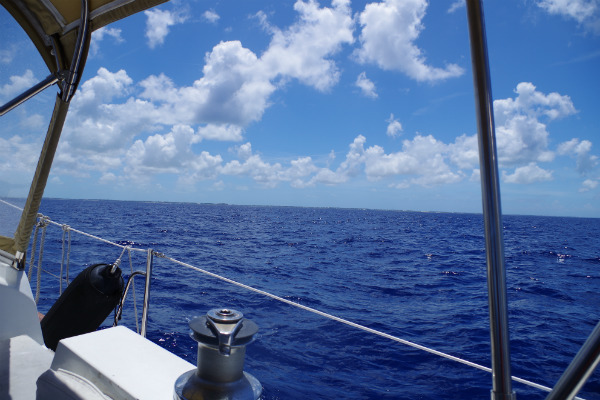 We left early the next morning to start across the Great Bahama Bank. The wind and waves weren’t nearly as calm as predicted by our multiple weather sources, but the first day wasn’t too bad. 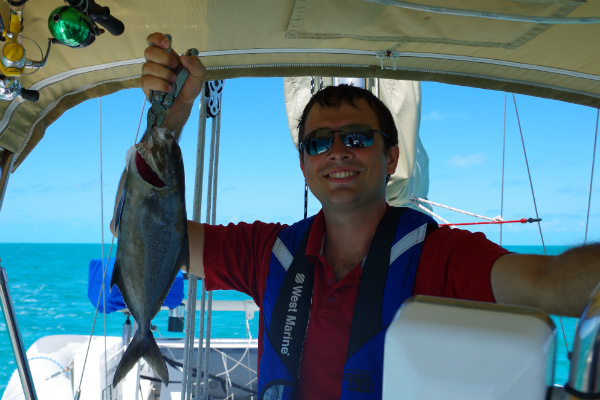 We even caught our first fish of the trip, a small black-fin tuna! Unfortunately, our second catch of the day broke our leader and stole our good trolling lure, so that was the end of the fishing for the trip. We’ll hopefully pick up another good one at one of the shops in Nassau and some stronger leaders too! Our first view of New Providence Island was a relief. We kept going back and forth on whether to stop for the night at the Northwest Providence Channel entrance or just continue on overnight to Nassau. In the end, we decided to do a little of both. 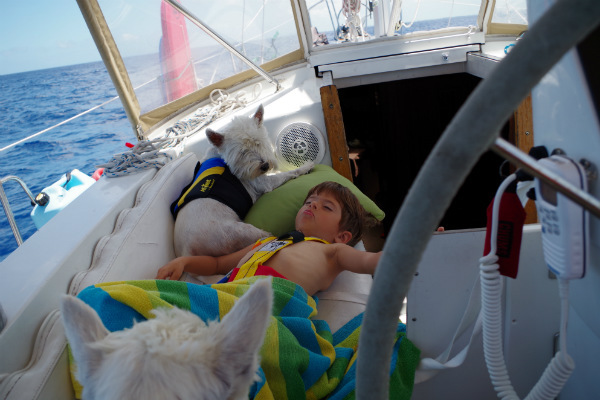 We anchored around 7 pm just behind the shoals north of Andros island to have dinner and get Carter to bed, since we knew it would be hard for him to fall asleep with the engine on. Dan and I got a few hours of sleep before pulling up the anchor at 1:30 am. 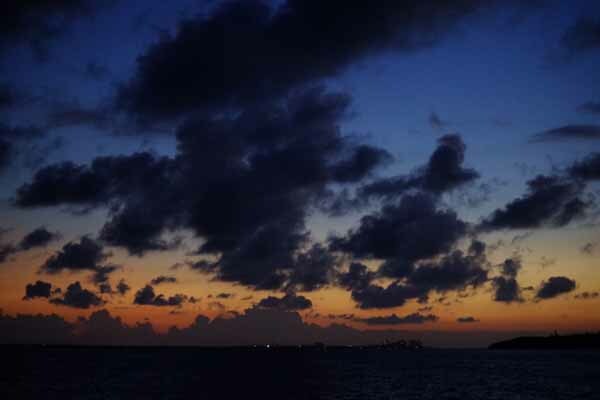 It was important to us to get into Nassau harbor before dark the next day and it turned out to be a good choice because once again the weather didn’t cooperate as we had hoped. Carter and the dogs prefer our land days. Throughout the day, we ended up with wind right on the nose and waves opposing which meant no sails and more engine time. We also discovered that the back-light for the engine thermometer was wired incorrectly, making the engine temperature appear higher than it actually was. This made us keep the engine running slower than normal, which made our trip about 3 hours longer than we had hoped to make the trip. The waves, time, and the added bonus of Carter and I both being seasick for a few hours meant that we were all exceedingly happy to see New Providence Island on the horizon. We went through Nassau Harbor with no problems and were all relieved to be back on land for a few days before heading to the Exumas.